Since the individual sizes of plants and their parts may vary within wide bounds, occasionally found oversize specimens of a species may be impressive but not significant. In the case of Rhynie chert plants, however, the bounds have not yet been firmly established so that new data concerning sizes will be of interest. This applies even to the most abundant plant in the Rhynie chert, Aglaophyton major. Under its old name, Rhynia major, its height was once thought to reach half a meter but now a value of 18cm is preferred. One wonders how this seemingly accurate value may have been obtained as it is very cumbersome to find out the original height of a plant embedded in chert. So the suspicion arises that an estimate of "nearly 20cm" had been transformed into "about 7 inches" and then back to centimeters, which makes 18, the number found in various publications. More easily accessible to measurement is the diameter of the sporangia. Most often, of course, the sporangium is not cut perpendicular to its axis but in a more or less inclined way so that the circular cross section appears elliptical. Then the smaller axis of the ellipse can be taken for the diameter of the sporangium, provided that it can be excluded that the sporangium had been squeezed before silicification and has been cut in such way that the section does not represent the real size. diameter 6.5mm instead of < 5mm as hitherto assumed. 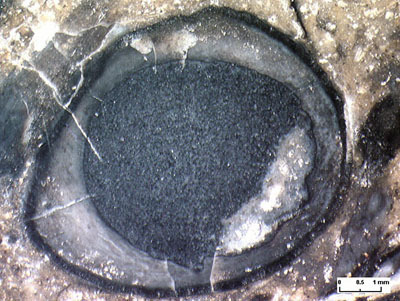 According to the standard work on Aglaophyton , the diameter of the sporangia is 4 to 5mm. (A limit < 4mm given in the same paper is apparently a misprint and should be read < 5mm.) A few sporangia with diameters above 6mm have been found lately. A big one with 6.5mm is shown here. The non-uniform thickness of the sporangium wall is an artifact due to partial detachment of the outer layer and damage to the inner layer by spore eaters. More observations on Aglaophyton can help to establish a consistent picture of this plant.